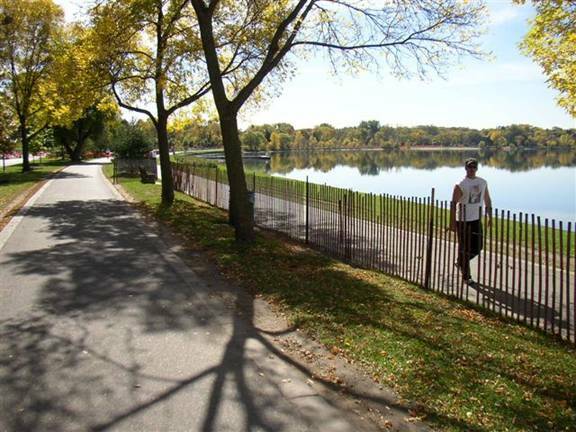 Minneapolis holds many attractions, not only for city-dwellers, but also for nature lovers and cyclists. 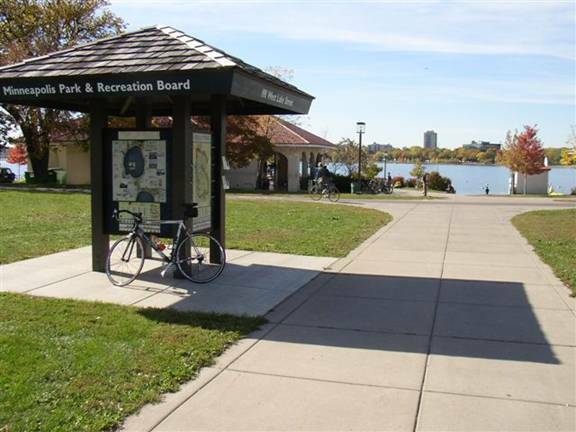 I had skated around Lake Calhoun and Lake Harriet on roller blades before and seen the active outdoor scene unfolding around those lakes in summer. 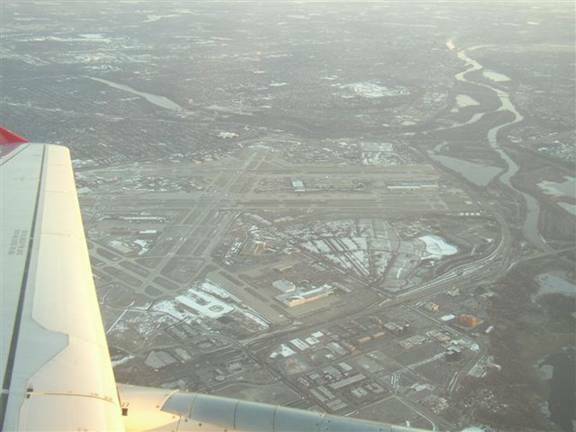 I had also often seen the lakes and the Mississippi river from the air due to most of my airtravel going in and out of the MSP hub. After seeing a sign of the “Grand Rounds” bike path through the city I got curious. A few minutes of research on the Internet revealed lots of information about this route. 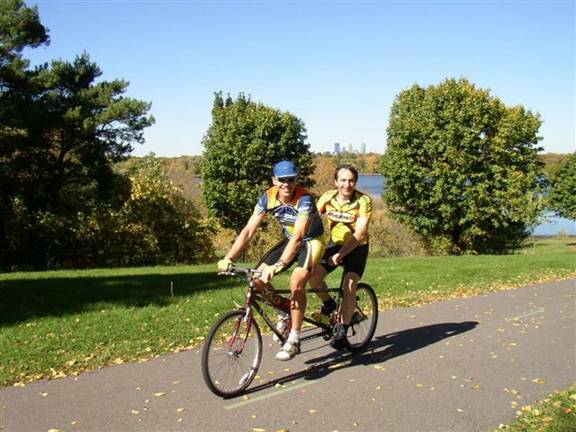 It’s about 50 miles of mostly bike path along lakes, golf courses and the Mississippi river. I figured biking this loop would be a nice way to combine sight-seeing with some light form of exercise, especially in the fall when the leaves are turning. So when a friend from Munich, Germany came to visit the area for business, I had made some plans to check out this bike path. I took off early morning in the pre-dawn hours to take advantage of the splendid weather forecast for this weekend. Driving into the sunrise during the first hour after leaving Fargo along I94 was a great way to start the day. For breakfast I stopped in Alexandria – the city which calls itself the “Birthplace of America”. There is this little place housed in a former railroad station. 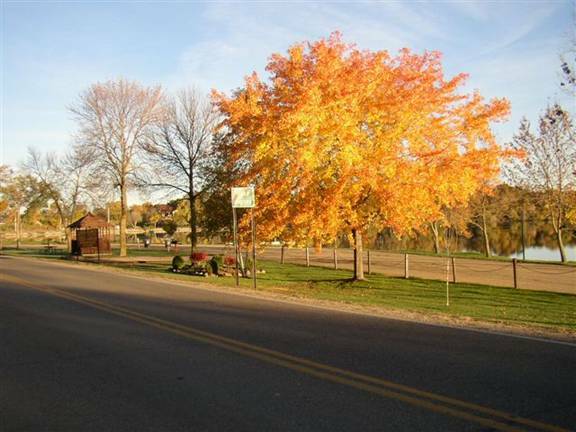 The road visible on the right is one of the “rails-to-trails” bike path which is closed to motorized traffic and offers a paved path along a former railroad track. I’ll have to come back to this one some time in the future. With plenty of time due to getting up this early, I enjoyed a fabolous breakfast with pancakes, coffee and icecream, all for less than the price of a medium sized latte at your local coffee shop. Outside the autumn weather was putting on a great display of fall colors. I continued the drive to Minneapolis and made my first stop there at the REI store to buy a new bike shorts. I was not in a hurry as the morning was quite cool and the autumn sun needed a couple of hours to warm up the crisp air. Shortly after noon I headed towards Lake Calhoun. It was already 1:30pm when I parked my car and unloaded my bike to get ready for the leisure ride around town. 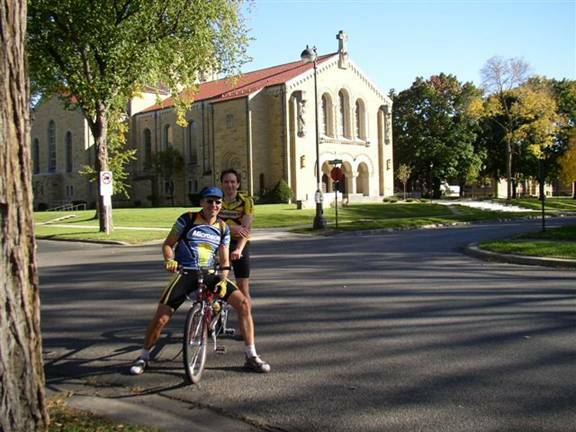 I couldn’t help but think of the last time I was bike riding just 3 weeks ago: By this time of the day I had already been riding for 13+ hours and covered 250 miles (400 km) on my Iowa to Canada ride! 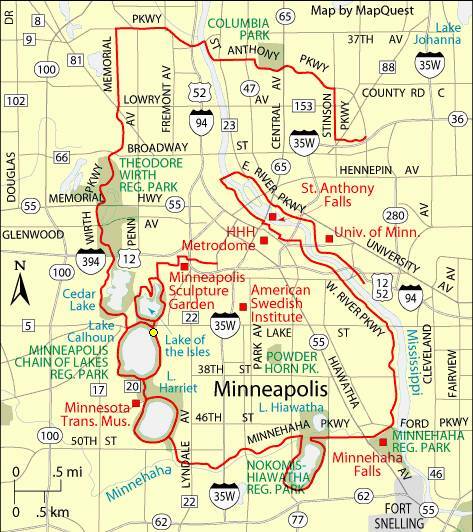 This picture marks the NE corner of Lake Calhoun, one of my favorite spots (indicated by the yellow dot in the above map). Maps show the way around the Grand Rounds so for the most part it’s easy to follow. I turned on the music in my iPod and started to enjoy the route mostly following along nicely paved bike path. It was a perfect day with plenty of sunshine, temperatures eventually rising into the low 70’s, no mosquitoes, no wind, no crouds. What a way to explore one of the larger cities of the United States! I circled many of the lakes once or twice just for fun and to get some mileage. Of course you stop often to just sit by the lakes and take in the colors. 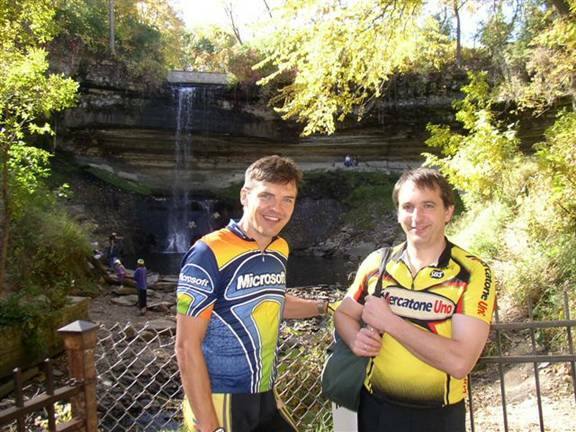 One such stop is at the Minnehaha falls in the SE corner of the loop. A friend of mine told me some time ago that the word “Minne” in the language of the native Indians means water. I forgot a few of the other words he explained to me as in “Minne-sota”, “Minne-apolis”, “Minne-tonka”… but it is no joke when I tell you that “Minne-haha” means the “laughing waters”. Back from the historic roots to the more contemporary sights along the river. The modern buildings and bridges along the Mississippi river had me stop more than once for some picture taking. There was only one area in the Grand Rounds loop where I got confused. To connect from the St. Anthony falls near downtown to the Stinson Parkway in the NE corner of the loop you have to find your way through some regular streets. Since it is not well marked I got lost a bit, but I didn’t mind searching around which just added a few miles to my journey. I crossed over the Mississippi river again on the North side of the loop and followed the majestic Victory Memorial Parkway. As the afternoon progressed I noticed the air getting cooler again in the longer shadows of trees and buildings. At Cedar Lake with my loop nearly completed I stopped where two locals were just pulling their kayaks out of the water. After a mutual introduction – “Nice kayak!” “Thanks, nice bike!” – a short conversation ensued expressing the appreciation for the wonderful day and the various ways to enjoy it, pedaling or paddling. 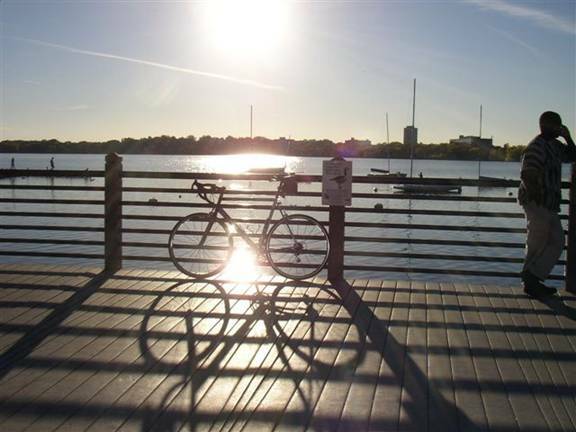 I stowed my bike away in the car and strapped on the roller blades to circle Lake Calhoun one more time as the sun was setting. 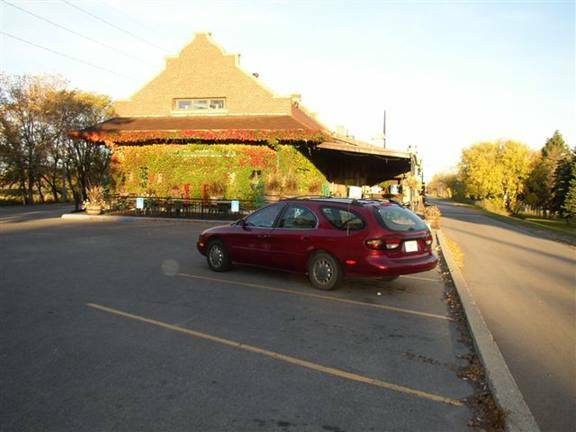 After plenty of sunshine and some good workout I drove over to my favorite Italian restaurant - Romano’s Maccaroni Grill on Frances Ave near Centennial Lakes Park in Bloomington. Dinner rarley tasted better than this evening. This trip had been something like a test ride to see whether this loop would be a good trip to do with my friend who would come to town the next day. I can assure you that the Grand Rounds on a day like this is well worth the trip! 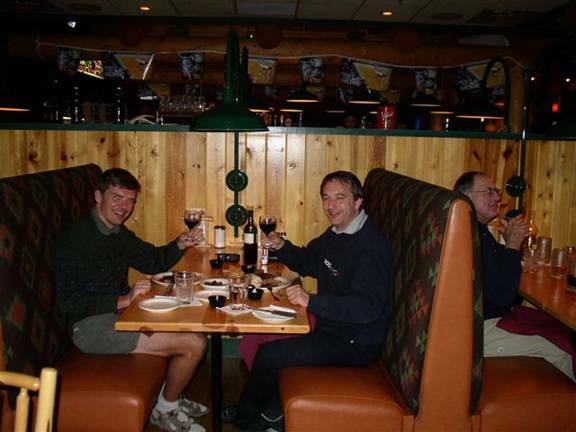 My friend Klaus from Munich was traveling in Toronto and had announced his plans to come over to Minneapolis and Fargo on business. Today he would fly into the MSP airport at the confluence of the Minnesota and Mississippi rivers, as pictured here on a flight a few weeks later in late November. I drove to MSP to pick up Klaus. Timing was perfect as I had just parked and walked over to the baggage claim area when Klaus was about to step out of the building. 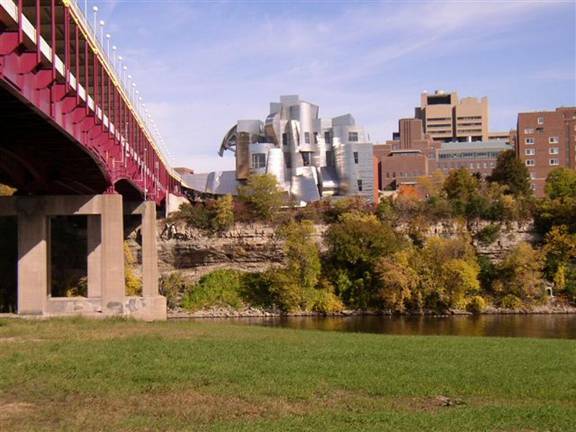 After a few phone calls we drove over to St. Paul: Our first stop would be the Xcel Energy Center located in downtown St. Paul near the big Cathedral. 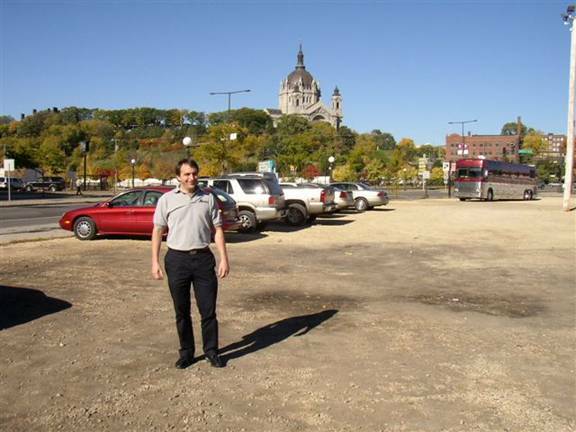 Eight months ago they had built the famous St. Paul ice palace on this very parking lot. Then it was some 80F colder and you could barely stand the blistering cold wind even when bundled up. Not so today… Klaus wanted to check out the interior of the Xcel Energy Center, one of the foremost ice hockey arenas in the nation. Klaus met with a business associate of a company which outfits arenas with plastic panels to cover the ice when the arena is used for other events. This arena is a most impressive facility and is also said to have excellent acoustics for the occasional rock concert. 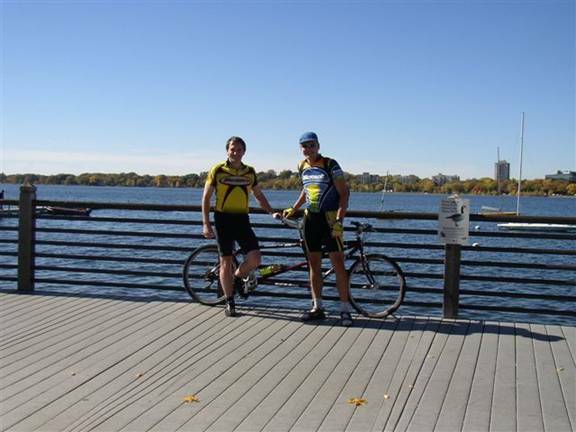 After this site visit we drove back to Lake Calhoun. Through Internet search I had found a bike shop close by: Calhoun Bike Rentals located just a block away from the pavillion on 1622 W. Lake Street. We rented a tandem bike! This really turned out to be a brilliant idea: We would have some fun as well as plenty of time to talk while riding. Since it was the first time either one of us had ever ridden on a tandem, it took a few minutes to get used to the slightly different dynamics. Turning is a bit tricky as your wheel base is much longer and you tend to cut corners. Also, it feels a bit awkward at times when the pedals continue to crank even though you just stopped pedaling to roll. But it was great fun anyway. Klaus especially enjoyed the opportunity to get some form of moderate exercise into his busy schedule of business travel. 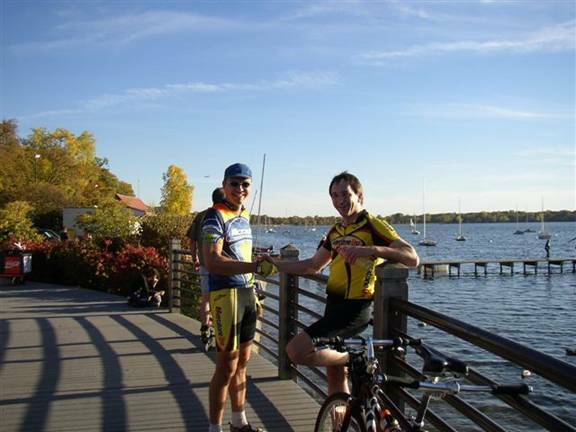 This picture shows us next to Lake Nokomis / Lake Hiawatha with the skyline of downtown Minneapolis in the background. Not far from there we stopped at the Minnehaha falls for some refreshments and coffee. With the beautiful autumn waether it was no wonder the other visitors found us with a great smile on our faces. Klaus is a longtime friend of mine since the days of high school in Munich. Consequently we spent hours talking about our family and professional lives. It was absolutely wonderful to chat about all these things while at the same time pedaling from one scenic sight to the next. 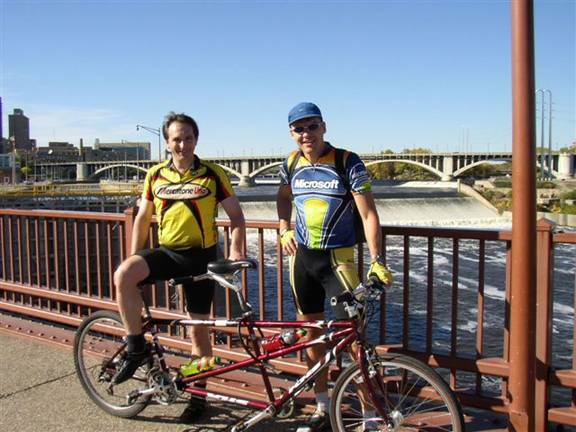 Occasionally we stopped for a picture or two, such as at stone bridge across the Mississippi near the St. Anthony falls. We got lost again in the NE section of the Grand Rounds, but again neither one of us was bothered by it as we just added a few miles to our workout. Even when there is no bike path, mostly the loop just follows fairly quiet neighborhoods with little traffic such as here on the NE corner of Stinson and St. Anthony Parkway. We continued along the golf course of the Columbia Park. Everybody was enjoying this beautiful day. Prior to crossing the Mississippi river again we came to the scene of a fresh car accident. A nasty looking head-on collision reminded us of the dangers of motorized traffic and kept us alert for the occasional crossing of roads and intersections. 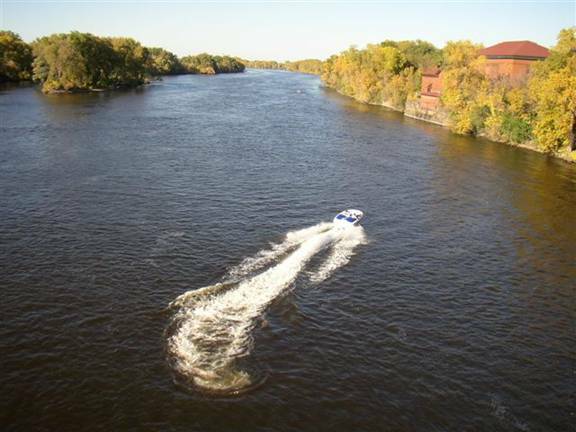 We stopped for a sip of gatorade on the bridge and watched someone playing with a powerboat on the Mississippi river against the backdrop of a caleidoscope of autumn leave colors. About 4 hours after we had left we got back to the pavillion at Lake Calhoun. We stopped to enjoy the warm sunshine one more time. From there it was a short hop back to the shop just a block away. 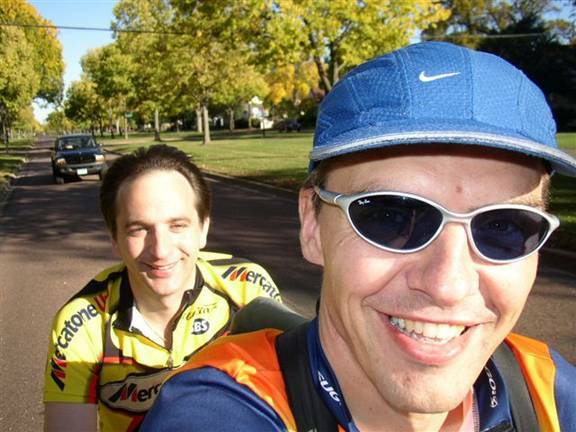 We changed our bike outfits for some regular cloths and started the trip back to Fargo. Taking advantage of the last hour of daylight in the short days of fall we made it back to St. Cloud and stopped there for dinner.